Here’s an app you might want to have handy the next time you go on a fly-by-night vacation: Booking.com launched an app on Thursday, Booking Now, which simplifies the process of finding a hotel at the last minute. Booking Now isn’t replacing the existing Booking app for iPhones, but it could end up superseding it eventually. It’s an attractive modern mobile user interface over the existing Booking.com service with one catch. Because it’s a same-day booking app, you can only book a room for tonight or tomorrow. After your provide your email and a few accommodation preferences, like how much you’re willing to pay and whether you’d like Wi-Fi, you’re swiping left and right like Tinder to search your nearby lodging matches. Booking.com is one of several travel companies, including OpenTable and Kayak, owned by U.S.-based Priceline. As one of the major legacy booking companies, its system tracks a lot of rooms — more than 580,000 properties, according to the company. Sometimes you miss a more fully-featured app. For instance, when looking for a hotel in New York, it suggested a room in Midtown, which was over 30 blocks away. There were closer hotels, which could be found by swiping left, but Booking Now didn’t offer them as the first choice because of price. You can’t see your options in the form of an organized table. Even though the app asks for your credit card number, it’s only used to confirm your reservation. When you get to the hotel, you pay for your lodging directly, instead of the credit card on your account automatically being charged. Users should also be aware that most hotels don’t accept cancellations within 24 hours of the reservation, and if you booked your room on the same day, that means you’re out of luck. 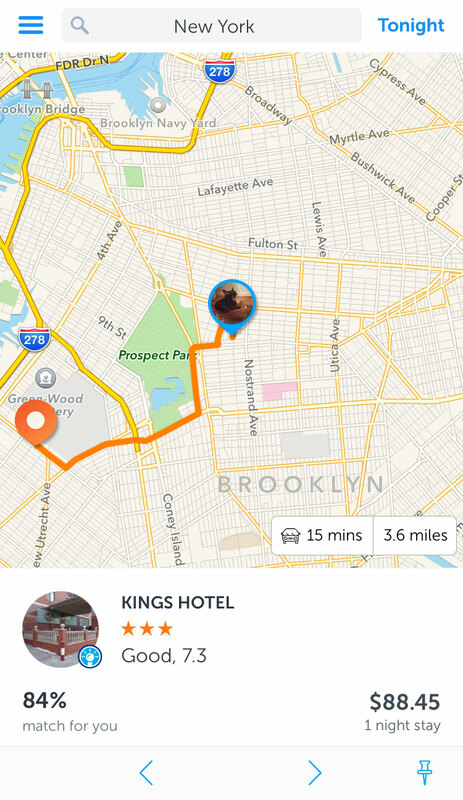 Last-minute booking apps on mobile have been hot lately. Mobile-first competitors like HotelTonight and Vayable offer quality, visually appealing same-day booking mobile apps, and they are using successes there as a foothold to expand further into other travel services. Sharing apps like Airbnb have their own last-minute booking services on mobile too It’s no wonder travel services giant Priceline is revamping its mobile apps in a big way. Booking Now is available on iOS now and Android phones soon. Old news. The Booking.com now app has been around for a year or more. As pointed out in the article, this is a new app, called Booking Now, which only allows you to book a room for tonight or tomorrow. It was launched yesterday. Read, then comment.